Few things get American sports fans more pumped than a championship football game. It doesn't matter if it's Pop Warner, going to state in high school, a college bowl game, or the Super Bowl—football is a way of life in this country. And over the years, countless filmmakers, screenwriters, and production companies have tried to replicate the excitement of a big game in movies and TV shows. In case you've been living under a rock over the past two weeks, you’re well aware that Super Bowl XLVI is this Sunday. And while there will be a long wait for more football after the New York Giants and the New England Patriots square off, there are plenty of football movies and television shows to scratch that pigskin itch during the offseason. 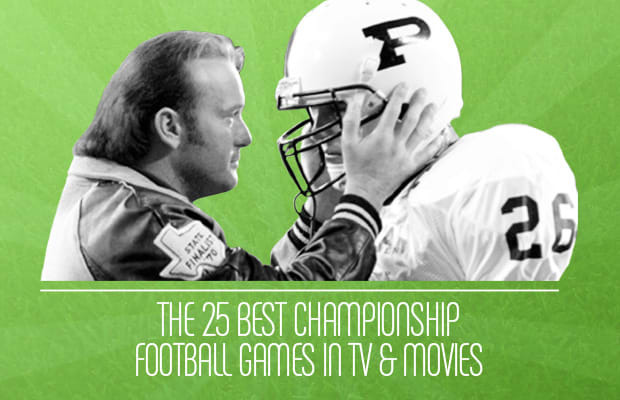 So to point you in the right direction, we give you The 25 Best Championship Football Games In TV And Movies.